‘Intelligent Efficiency’ | "Global Possibilities"
The US could reduce its energy use by up to 22 percent by using a systems-based approach to increase efficiency, according to a report by the American Council for an Energy-Efficient Economy (ACEEE). The nonprofit calls this approach “intelligent efficiency,” and says the key to understanding it is to stop thinking about energy efficiency in terms of individual devices — such as cars or refrigerators — and to start thinking about it in terms of complex systems — entire cities, transportation systems and other networks — connected through Internet and computer technologies. People-centered efficiency provides consumers with greater access to information about their technology use and the tools to reduce it. For example, consumers can observe home-energy monitors, see when and how much energy they use, and change their behavior. Technology-centered efficiency encompasses “smart” technologies that use sensors, monitors and other controls to optimize energy systems in buildings, industries and transportation systems. Service-oriented efficiency gives consumers the option to substitute one material-based service, such as an in-person meeting, for an information and communication technologies-enables service that uses less energy, such as videoconferencing. The US uses intelligent efficiency to some extent in homes, buildings, industry and transportation sector, ACEEE says, and provides 10 case studies in the report. 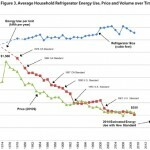 For example, some products, to meet upcoming federal efficiency standards for residential refrigerators, are using technologies such as variable speed compressors and fans that use sensors and controls that may reduce the appliance’s energy use by at least 5 percent (see chart), according to the report. Looking ahead, it says smart appliances will be able to communicate with the electric grid by receiving a real-time price signal from the utility, which it will then use to adjust its energy use. The report lists three barriers to intelligent efficiency: societal, financial and structural. Homeowners, business owners and policy owners lack awareness of intelligent efficiency’s benefits, and may approach new technologies with uneasiness, it says. Additionally, implementing intelligent efficiency approaches may involve significant up-front costs, and the US lacks a workforce skilled in managing intelligent energy systems. In response to these barriers, policy makers should educate their peers and the public, and lead by example by implementing intelligent efficiency in their own operations. Making more detailed energy data available, ensuring that consumers can access this information and investing in the development of human capital required to deploy intelligent efficiency can also encourage this approach, according to report authors. Redefining regulatory business models under which public and private entities operate will send a signal to markets to promote great systems efficiencies, the report says. In a paper published in April, ACEEE said tax reform could remove barriers to energy efficiency investments.